Fun is great but so is building brand awareness, user engagement, and creating unique experiences. Our machines can even break the ice, capture email addresses and raise money. We hope to make your event one to be remembered! We're the oldest network of nationally supported but locally owned and operated photo booth companies in the entire country. We've been doing this for 14 years+ (since 2005 before it was cool), have captured over a million Smiles and Counting® (including A-List celebrities, members of the First Family, and everyone between) and understand how important your event is. We even have the awards to prove it...and yes, photo booth awards do exist...and no we don't mean we give photo booths as awards. It's impossible to provide the best photo booth experience when you're the DJ and the Wedding Photographer (no offense to photographers named DJ). By focusing only on your photo booth rental, we're able to give you 110% ensuring that your experience is unrivaled and exceeds all expectations. In addition to the sweetest photo booth or photo stand in the Galaxy, every rental typically includes: An incredible on-site attendant, unlimited double-prints, free on-site reprints, photo filters, animated GIF creation, webhosting with free downloads, setup, delivery and removal. Ridiculously expensive gear paired with real-time image enhancements create images of the highest quality. Our proprietary software analyzes and adjusts every image to ensure proper color rendition, contrast, exposure and sharpness. You can even enlarge your favorite pose to a 16x20 without any loss of image quality! Yes. There's Even More Included. Modern, spacious, and a red carpet experience without the dirty rug! Our Open-Style Photo Stands give your guests the gift of a VIP treatment while providing even more room to show off their duds and get their goofy on. Personalize the background, choose from multiple layouts, and enjoy frame-filling photos of both small and large groups. Want prints? We have you covered! Choose between printing one 4x6 (for the guest) or two 4x6's (for both you and the guest). Prefer keeping it digital? We do that too. Save some moola with our "No Print Option" and provide images in real-time via text messaging. The Photo Stand can either take 4 photos per session (aka 4-UP) or 1 photo per session (aka 1-UP). The 4-UP is perfect for creatives and selfie junkies while 1-UP sessions takes less time (great for events short on time with lots of guests) and print larger photos. Seeing is believing. Request Free Samples here! Is The Photo Stand Right For You? Think retro, charming, cozy, and classic. Our booths are jam-packed with unique features, create vintage style selfies, and churn out priceless photos faster than you can say "cheese!" Guests love party favors and we've got you covered. Since the very beginning, photo booths have always printed a series of vertical portraits on a skinny strip. We've kept the tradition alive and added a second copy so both you and your guest have a priceless, retrolicious keepsake.Wanna be dazzled? Request real samples HERE! Avoid the who-gets-this-photo fight! 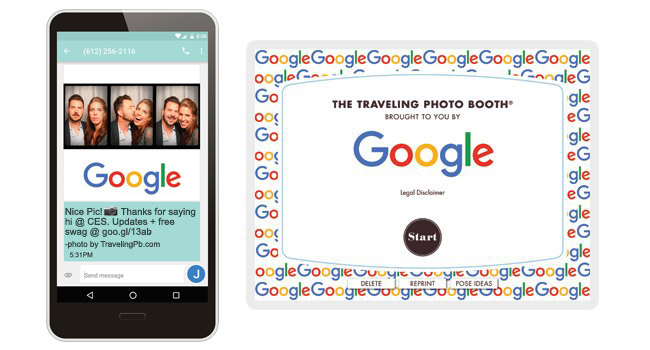 Guests can instantly reprint their favorite photos in their favorite filter for free. Floor space is precious and our photo booth barely takes up 6.5' by 3.5'. Heck, that's smaller than some wild dogs. Is The Photo Booth Right For You? Include your logo and/or message on every digital photo and on our touch screen. Watch users engage with your Brand while taking and sharing branded photos with friends and family. Branding can even be included on the printed photos as well as the background. CLICK HERE for info. 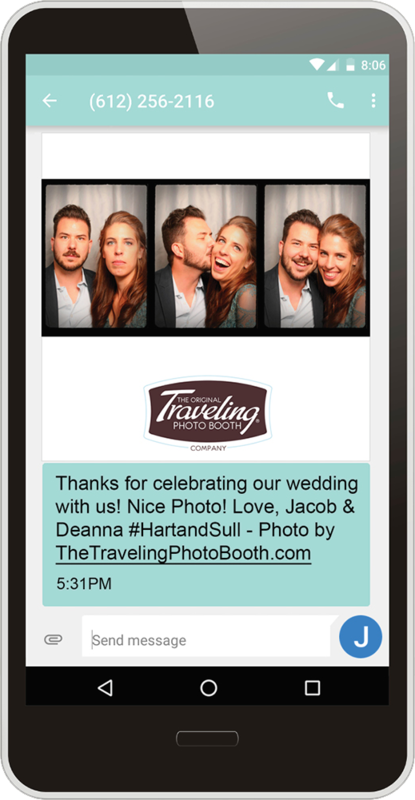 TeleBooth® lets guests INSTANTLY text their photos and Animated GIFs to their phones! This straight-forward and simple approach to sharing has resulted in an INSANELY high percentage of users using TeleBooth®. Bonus: You can even personalize the message! 1. After taking their photo or GIF, users have the option to enter their phone number into the machine. 2. We instantly encrypt their number (we care about privacy) and within seconds, they receive their photos or GIFs via text along with a personalized message from you. *Standard text messaging/data rates may apply. Requires the "The Social Package" add-on. 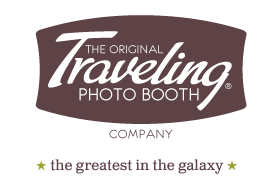 Award-Winning Photo Booth Rentals for corporate and nonprofit events.